Well, it seems that every blogger, Tweeter, and message board poster has an opinion on the Topps Million Card Giveaway, so I thought I'd share my 2c as well. Albeit and as to be expected, from a different perspective. Despite, the site crashing several times as a result of the much anticipated launch and the collector rush to see if they are the lucky one to redeem a '52 Mantle RC, all in all, I'd have to say this has been a very successful promotion by Topps. Many people were frustrated that Topps Series 1 released over a month prior to the site and promotion being live. However, I honestly believe this was a classic PR stunt to build anticipation and generate hype and not a failure of planning by the marketing and IT departments. Not content to let traditional Hobby media sources carry the exclusive, Topps has partnered with the iconic, Cal Ripken Jr for a whirlwind media blitz starting tomorrow. According to their Twitter feed, "Check Cal Ripken Jr and Topps on 2/16 (who will be on) Fox and Friends, CNBC Power Lunch, MLB Network, Fox Business, Mad Dog Radio, SNY, ESPN radio and more." What better person than the face that, some say, helped save baseball after the disastrous strike of 1994 that saw the cancellation of a season including the World Series? Unfortunately, we live in a society where negative attention makes the best news story and all to often The Hobby is portrayed in the media as a greedy, self-serving industry, full of counterfeits, corruption, and forgeries. While these issues clearly exist, they certainly, in and of themselves do not define the hobby we love. In an industry whose essence is the production of cardboard with pictures on them, its really hard to generate a buzz outside of traditional collectors and The Hobby media. 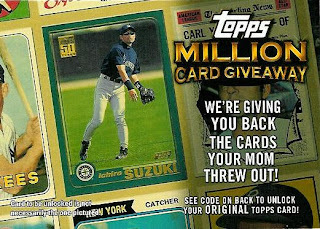 Topps may have very well succeeded in overcoming that hurdle with the Million Card Giveaway. It will be very interesting to see what tomorrow brings and the questions to be asked of Cal Ripken Jr by the mainstream media's talking heads. Full details, including rules, shipping rates, insertion odds, etc. I think it was one of their better ideas, honestly. Sure, it's hit or miss (but, really, do people expect each code to be a good card?). I was lucky, but I know if I get another code card I'm just as lucky to get a 1989 Gregg Jefferies. It's fun, and when it evens out, it will be even more fun and great promotion for them.